There was a day a couple of years ago when I passed the old trotting race track on Interstate 10 and I said to Lady Tater, “I’m going to do a video on that old dinosaur.” Someone beat me to it and Dan Carter did one hell of a job. Kudos Dan. Although this video is about, I’m holding my fingers in a cross as I say this, trotters, Carter found the exquisite brilliance of the 60’s architecture in this video short. His natural genius to see the best shot and capture it in his film is nothing but ordinary. I wish he’d do it in black and white. I hate plagerism but in this case Mr. Carter is unequaled so I’d like to give the credit where the credit is most certainly due. 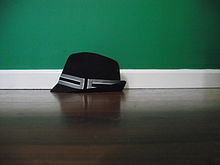 I tip my Trilby off to you and even do more as to toss it upon the floor in tribute. The Phoenix Trotting Park, a horse racing track, was originally built in 1964 in Goodyear, Arizona. It opened in 1965 and was run for about two and a half seasons. The large, futuristically designed structure gave an optimistic look for the 1960s. Originally planned to be built for a cost of about $3 million, the facility ended up costing around $10 million. Various incentives during the events that were held, such as free parking andadmission did initially lead to decent attendance. However, a variety of factors led to the inevitable closing of the track. The hot weather of the desert caused events to be uncomfortable to attendees. The location provided limited means to control rain, leading to floods that caused accessibility problems. The park is also located about 20 miles outside of Phoenix and was built long before any major roads made the area easily accessible to those in the city or its suburbs. Thanks Charlie, and that comes from the birds. . .